No doubt indicated to some by the alignment of the planets and the reading of a small animal’s intestines, but in our case by such mundane means as a calendar, there was early observed in this year of our Lord 2009 the propitious sequence of dates such that Mayday fell on the Friday preceding the 21st Kellybrook Cider Festival weekend in outer Melbourne. Members of the Adelaide Morris Men , some having previously attended, some of a superstitious nature, and all having been regaled with tales by past attendees and by Britannia, the hosting side, were determined to attend given such favourable circumstances. Attrition by obligation reduced to four those of the side to make use of this fortunate sequence. This saw the entire side up at sparrowfart to dance in Victoria Square (the centre of Adelaide) on Mayday as per tradition, followed by the (also traditional) breakfast fry-up at Zuma’s at the Central Market . We then forgo the day dancing at pubs with other sides as three of the side headed east in the early morning for Melbourne to try their Morris fortune in the bigger city, while another, similarly encumbered with aforementioned obligations, but of greater determination , follows later. 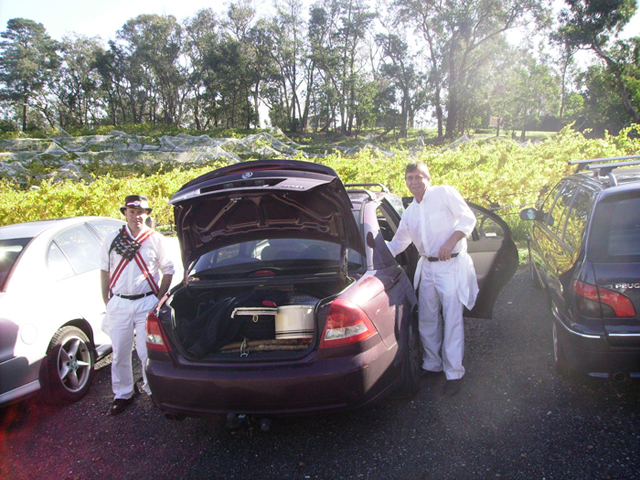 We lobbed at Kellybrook Winery , just east of Melbourne, on Saturday morning to find several marquees, Morris sides, a multitude of employees , the management and a band, all in various stages of preparation. 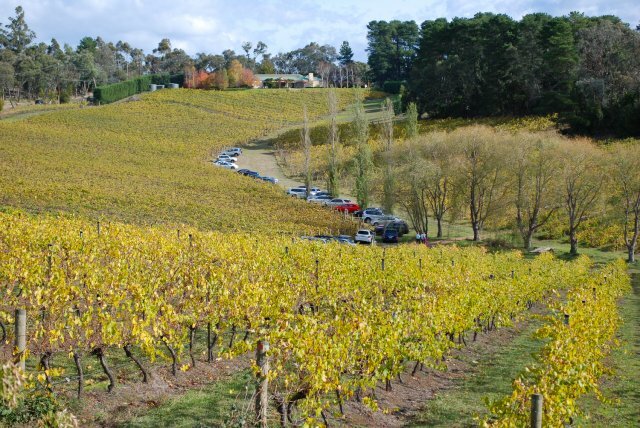 Greetings of friends and acquaintances was even more vigorous than usual, probably heightened by the recent “Nash”(National Folk Festival) in Canberra. 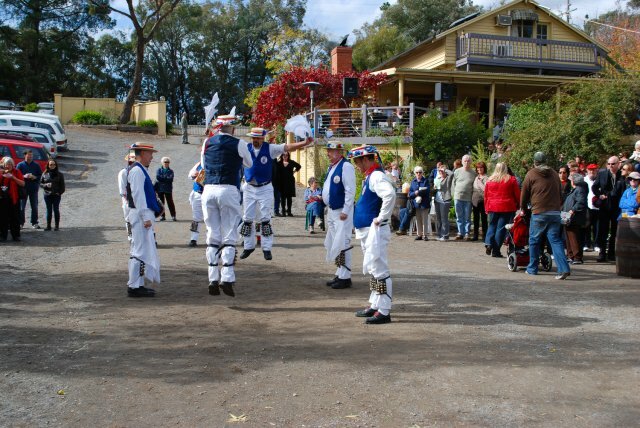 Sides highly represented that day were Brandragon – a local mixed North West team – and Morris Men of the Adelaide, Britannia and Whyalla pedigree. Everybody benefitted from the warm up dances in the morning and by midday the punters were rolling in. A brief but touching memorial service was held by his Britannia brethren for Derek “Drafty” Brown who shuffled off this mortal coil a few years back, doing what we all would probably prefer to be doing at such a moment (i.e. dancing) and quite literally on that spot. Sunday we danced again at Kellybrook with an increase of both punters and Adelaide Morris men, and, despite an absence of Brandragon, the day was at least as successful. Past members of sides, present on both days, injected a dose of variety and nostalgia into the general mix. Sunday’s close saw the explosion of the Morris collective back to their respective spheres, eventually, with remnants of Adelaide passing the night in an alcoholic miasma at Nat James’ (Brandragon) place after a pub meal featuring fricassee of some of our more flavourite national emblems, notably kangaroo. The taxis to the red-eye were to be endured rather than enjoyed. Our perception of the weekend dancing is blurry, due to the quantities of both cider consumed and dancing performed, though both were generally of good variety and standard. The cider, initially with the rather novel quality of ‘freshness’, continued its fermentation throughout the weekend, commencing proceedings with an appropriate lightness of flavor and alcoholic content yet seeing out Sunday with complexities of the same qualities such that the focus and endurance of some participants , both in and out of the sets, were, almost imperceptibly, flagging. I wrote and rapidly deleted some stuff here about how good it is to dance with other sides… If you dance you know, if you don’t dance, ask someone, or skip to the footnote** below. The weekend was a hoot and will surely become a regular gig on the calendar. Removing my pants whilst standing on the footpath in a puddle of muddy water outside the famous Keith bakery, is a moment that will live with me forever. What kept me going was the thought of all that free cider! Cheers Roger! Worth the effort. Yet another spiffing good Britannia show………….. Not since all those Asiatic gentlemen meandered down the Malayan Peninsula, c 1942, (obviously heading for “The Raffles”) have been seen so many ,……”people in Caps”. Thanks to Nobby (Jiggolo) Edwards, and Deborah for 2 nights hospitality. And some rather nice ale at the Coldstream Brewery afterwards. Should we teach them “rounders” on site next year? Or maybe a cheese rolling, from the Kellybrook front gate! !